In this Raspberry Pi Mobile Phone Project, we have used GSM module and Raspberry Pi 3 to control whole system’s features and interfacing all the components in this system. A 4x4 Alphanumeric Keypad is used for taking all kind of inputs like: Enter mobile number, type messages, make a call, receive a call, send SMS, read SMS etc. GSM Module SIM900A is used to communicate with the network for calling and messaging purpose. We have also interfaced a MIC and a Speaker for Voice Call and Ring sound and a 16x2 LCD is used for showing messages, instructions and alerts. Alphanumeric is a method to enter numbers and alphabets both by using same keypad. In this method, we have interfaced 4x4 keypad with Raspberry Pi and written Code for accepting alphabets too, check the Code in Code section below. Working of this project is easy. All the features will be performed by Using Alphanumeric Keypad. Check the Full code and a Demo Video below to properly understand the process. Here we are going to explain all the four features of the projects below. ATDxxxxxxxxxx; <Enter>     where xxxxxxxxx is entered Mobile Number. And send 26 to GSM to send SMS. +CMTI: “SM”,6  Where 6 is message location where it stored in SIM card. When Raspberry Pi gets this ‘SMS received’ indication then it extracts SMS storing location and sends command to GSM to read the received SMS. And show a ‘New Message’ text over the LCD. Now GSM sends stored message to Raspberry Pi and then Raspberry Pi extract main SMS and display it over the LCD. Note: There is no coding for MIC and Speaker. Check the Full code and a Demo Video below to properly understand the process. 16x2 LCD pins RS, EN, D4, D5, D6, and D7 are connected with GPIO pin number 18, 23, 24, 25, 8 and 7 of Raspberry Pi respectively. GSM Module’s Rx and Tx pin is directly connected to Raspberry Pi’s pin Tx and Rx respectively (Ground of Raspberry Pi and GSM must be connected with each other). 4x4 keypad Row pins R1, R2, R3, R4 are directly linked to GPIO pin number 12,16, 20, 21 of Raspberry Pi and Column pin of keypad C1, C2, C3, C4 are linked with GPIO pin number 26, 19, 13 and 6 of Raspberry Pi. MIC is directly connected to mic+ and mic- of GSM Module and the speaker is connected at sp+ and sp- pins for GSM Module with the help of this Audio Amplifier Circuit, to amplify the output audio. This Audio Amplifier circuit is optional and you can directly connect the speaker to GSM module without this Audio Amplifier. Programming part of this Raspberry Pi Mobile Phone is a little complex for beginners. We are using Python language here for the Program. If you are a beginner in Raspberry Pi, you should check our previous tutorials for Getting Started with Raspberry Pi and Installing & Configuring Raspbian Jessie OS in Pi. In this code, we have created def keypad(): function for interfacing simple keypad for entering numbers. And for entering alphabets, we have created def alphaKeypad(): so that same keypad can be used to enter the alphabets as well. Now we have made this keypad multi functioning same as Arduino keypad library. By using this keypad we can enter characters and integer by using only 10 keys. Like if we press key 2 (abc2), it will show ‘a’ and if we presses it again then it will replace ‘a’ to ‘b’ and if again we press three times then it will show ‘c’ at same place in LCD. If we wait for some time after pressing key, cursor will automatic move to next position in LCD. Now we can enter next char or number. The same procedure is applied for other keys. Now we need to write some function for driving LCD. Function def lcdcmd(ch): is used for sending command to LCD and def lcdwrite(ch): function is used for sending data to LCD. Along with these functions, def lcdclear(): is used to clear the LCD, def setCursor(x,y): is used to set cursor position at the LCD and def lcdprint(Str): is used to print string on LCD. After this we need to write some functions for sending SMS, receiving SMS, making a call and attending the call. Function def call(): is used for making the call. And function def receiveCall(data): is used to showing the incoming message and number on LCD. Finally def attendCall(): is used to attend the call. Function def sendSMS(): is used to write and send the message with the help of alphaKeypad() function. And function def receiveSMS(data): is used receive and retrieve the location of SMS. Finally def readSMS(index): is used to display the message on LCD. You can find all the above functions in Code given below. 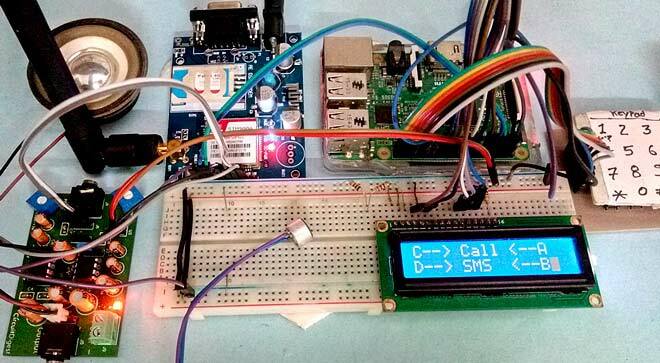 So this is how you can convert your Raspberry Pi into a mobile phone with help of GSM module. Also check this Raspberry Pi Touch Screen Smart Phone. Hello. I am final sem student in Mechatronics and I was planning to do a similar project for my final year. I wanted to to know if the GSM CAN AUTO-CALL a cell phone with a warning from a sensor? Instead of mic and speaker can we have an Android application that is connected to gsm module? What does "Serial.flush ()" ? I’m a student and want to know if you are willing to write some code for my raspberry pi using a gsm module to send images and video using a camera module. is this still possible if I replace the keypad into touch screen and make some GUI? Would it be possible to have the RPi listen to the audio stream for DTMF tones, from a cell phone button press (#* 0-9) and take action based on those tones?